iGPUs also are bad because they exacerbate the heat concentration problem. As transistors shrink, cooling becomes more difficult because of surface area bottlenecking. The one thing they're good for is reducing latency. Since GPUs are so parallel, though, and because they require so many transistors — they're a poor fit when it comes to integrated high-performance 3D graphics. Additionally, they eat into the surface area transistor budget for things like dummy material to reduce hot spots and duplicated resources for yields/harvesting. o they are octa cores in an ALU sense, but quad cores in an FPU sense. It just doesn't work like that, cores != ALU/FPU. A core is something that fetches , decodes , executes instructions and writes back the answer. Whatever those instructions may be and however that is accomplished, it doesn't matter. That's it, you can't mangle that definition in a million ways. A CPU can't act like an 8 core now and a 4 core in other situations, unless they are physically turned off. A Zen core has 4 ALUs, does that mean a 1700 has 32 cores when you do instructions with integer operands ? Obviously, no. Hey, not my fault AMD decided to create a Frankenstein's monster with the FX. Check the performance for yourself. The 8 and 9 series FX have 4 cores (modules, as they were called), so they are octa cores in an ALU sense, but quad cores in an FPU sense. Firstly, a module is not the same thing as a core. Secondly, it's impossible, as Vya Domus said (and I was about to), for a CPU to be both 8 and 4 cores simultaneously. there is a single FPU per module but it has two independent 128-bit FMAC pipes to allow executing two instructions (one from each thread) in parallel. So arguably each module has two FPUs when running 128-bit instructions and one FPU when running AVX-256 instructions (or MMX instructions). Since Bulldozer shipped, AMD has made modest improvements to the CPU’s overall efficiency and performance. Kaveri cut the penalty for multi-threading in half, from ~20% to 10% compared with typical core scaling. If AMD hadn’t been forced to lower clock speeds to compensate for its 28nm manufacturing process, Kaveri would’ve outperformed Richland across the board. Bulldozer is absolutely capable of executing eight threads simultaneously, and executing eight threads on an eight-core FX-8150 is faster than running that same chip in a four-thread, four-module mode. Bulldozer can decode 16 instructions per clock (not eight) and it can keep far more than eight instructions in flight simultaneously. If you want a much more Frankensteinian design, take a look at Broadwell-C.
Bulldozer/Piledriver are much simpler designs. Elegance and simplicity don't speak to performance. The Frankensteinian L4 on Broadwell-C certainly didn't hurt its performance, nor did the inclusion of an IGP or SMT. Broadwell-C was quite impressive considering its low clocks and power consumption. In fact, Peter Bright of Ars complained that Intel was robbing people of performance by refusing to put that L4 on Skylake. Bulldozer/Piledriver had poor IPC due to a combination of being forced to last much longer in the market than their Intel counterparts as well as design inefficiencies that may have been able to be overcome with strong further development. One of those was AMD's bet to make a pipeline that was very deep. Deep and narrow failed with the P4 but AMD tried that strategy, although adjusted, again. Had AMD devoted the kind of resources to improving their CMT design that Intel devoted to creating Sandy the performance would have been better. Better cache performance (e.g. Piledriver's L3 isn't so much better than fast DDR3, as far as I recall). Better instruction caching and prediction. Possibly a shallower and wider design. Possibly the addition of SMT to supplement the CMT. Possibly better Windows scheduling and optimization. Also, had Intel not created Sandy and had, instead, created a weaker CPU — then perhaps AMD would have decided to create a successor to Piledriver and it could have been quite improved. How many years have we seen people brag in forums about still using their Sandy chip because it was such a great value? There are three reasons for that. First is that AMD didn't compete well. Second is that Intel slowed down IPC gain. Third is that Intel got rid of solder. However, how much code optimization has to do with performance remains an open question. The game Deserts of Kharak showed Piledriver hanging in there quite nicely, despite being well out of date. Many other games showed terrible FX performance. 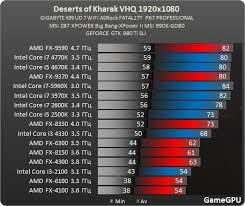 What is the special sauce in Deserts of Kharak that enable the FX to hang in there with Haswell? We never found out because it was basically an outlier. It would be interesting for someone to interview the developers to discover why their code ran so well on FX. The most basic assumption is that it, unlike other games of the time, did a much better job of leveraging the 8 cores. However, other factors are most likely also in play, like a lack of a DRAM speed bottleneck. Personally, I think it's much more interesting to know what is possible with CMT than it is to complain about AMD's failure with it. I still think it was ahead of it's time. Adding to the problems AMD had, being stuck on 32/28nm didn't help with the development of the FX arch, and Windows, as always, was very slow to adapt, a problem Linux didn't have. Kid, what are you, 12? Calm down. Gues what? I can play CS at 250FPS on my 100Hz just fine, I don't need a 240Hz monitor for that. The bending it's NOT that distracting or serious as you might believe, relax. No, they don't. Each core has 2 ALUs, look this stuff up before you even try to have a shot at arguing what is a fake core and what isn't. Excluding P4EE, they were the same chip with just a higher multiplier. Some of the cheapest models lacked HT, but a cheaper model was easy to overclock to similar (or even better since the OC'd FSB) performance as the flagship ones. What I meant, when thinking about the prices of hardware back then, you couldn't get the high-end version at 600eur/usd. Reason why Im still with Intel is because I use 240hz monitor and cant even look back to 144hz. Ryzen could not sustain those 160-200 fps on most games. But if Zen2 can do it I will jump to 8 core finally. Yes, and what I'm saying is that because Intel had yet to segment their proucts into "Mainstream" and "HEDT", P4EE was not the equivalent of a 6700K, 7700K, 8700K, 9900K etc. It was the equivalent *within intel's product stack* of a 7980XE, 9980XE, etc. That is to say, it had more raw power than any other Intel Chip and they priced it at the top of their stack because of it. To compare a P4EE to a 9900K in terms of where in the product stack they are is simply wrong - the 9900K is not Intel's single most capable consumer product. the 9980XE is, and is therefore the comparable CPU in 2018. what???? 240hz panel cant run in ryzen??? u on drugs. i only have a Ryzen Threadripper 8 core 16 thread 1900X on a Gigavyte Arous Gaming 7 X399 MB and run at DDR4 3400Mhz Wuad Channel an dthe 1900X All cores @ 4.0 GHZ and i have absolutely no problems runnin 240Hz???? Maybe another cpu that gets 90 degrees on a 100€ AIO and costs 600€. Is starting to get boring. I just hope AMD can finally improve IPC/clocks and gaming performance (yes I know someone will jump and say that is only a 5% difference when is not but whatever) and then Intel is officially done unless they start selling products with decent pricing. 500€ for a 8 core no HT cpu in 2018 is unacceptable. This might seem dumb for you, but as a curiosity, when I tell my mom that my "dream" cpu costs 500€ (she knows I love computers), she doesnt believe it. Is completly outrageous. I think some ppl dont even think about what 500€ are worth. Same goes for those dudes pumping 1300€ for a video card to play videogames. Mental. Im on this hardware stuff for almos 2 decades and I never seen high end pc components being so premium. I have money to buy those products but mentally I would never accept paying that kind of cash. Makes no sense. And even if you want a solid gpu like 1070 or 1070ti you spend 400€-500€ and already need to lower a lot of details at 1080p on recent games like shadow of the tomb raider or black ops4. Iv used AMD for years, most of my life actually ( back to the AMD 386.... even the K6-2 550 Super socket 7 CPUs, any one remember those lol, but besides iv been working with intel.and AMD back in the Pentium MMX days (JESUS I been doing this too damn long... but iv had intel back to the 8088/ then 8086, the first x86 CPU the 8086.... 2Mhz. wow that was sloww.. 286 8mhz , then 12m 16, to 20mhz then 386 + to pentium. pentium pro MMX Pentium II 3 and so on... i liked it better when AMD/Intel used the same DAMN CPU SOCKET?? ?WTF ever happend to that..
That's the series name or the absolute temperature they reach? How come intel's lake never dry up?! For enthusiast with DDR4 no reason to think about upgrade before DDR5. Why not? If I could get 8-12 cores for $200-250, I'd try it just out of curiosity. Assuming he means no reason to upgrade to Intel, I'd say it's because assuming someone built a Skylake or Zen 1 system that fit their use case, and as long as that use case hasn't changed, there's really no cost-effective upgrade they can make right now to do the same workload better. For people with Ryzen 1, a 2700X is a chunk of change for not very much uplift in heavy multitasking or parallel workloads. Sure, build a new system with one, but upgrading from Ryzen 1 to that? Not really worth the time and cost. For people with a Skylake or Kaby Lake chip, those are still extremely capable as gaming chips, and will handle 144Hz 1080p or 1440p competitive titles just fine even at some very respectable settings. Upgrading to an 8700K or 9900K isn't really a big improvement either, and that's even without factoring in a new motherboard and inflated pricing for Intel chips. - Almost certainly significantly improved architectures, being either Zen 3 or a *real* Intel response to Zen architecture, rather than just more rehashes of Skylake. For people who bought high-end rigs and who's need is staying the same, there's simply not really much reason to upgrade from Skylake or Ryzen 1. All the things those systems were good at, they're still extremely good at. And if they didn't buy high end rigs, well, they have an upgrade path within their own platform - they can buy an 1800X or a 6700K to replace their 1500X or 6400 and that will be much better price/performance uplift than investing in an entirely new platform. Great, I hope you will use them 24/7 together with HT Link, than you could enjoy nicely. You can buy and Threadripper with 16 cores for 500$ and you got nice 1600X for most of the time, excellent. And I could say WOW I want i9-9820X, 10C less than 1000$... but real difference between them and my CPU is how much is better on up to 4-6 cores, when difference is good in that situation we can talk than about even bigger improvement in core numbers. But only core number is nothing. If you'll notice, I currently being served perfectly fine by a quad core. So when I said I would get more cores out of curiosity, I meant just that.